2015 Continuous Assessment (FS 2016-3036). 2017 Conventional and Continuous Assessment (Fact Sheet 2017-3050). Schulz, Klaus J.; DeYoung,, John H.; Seal, Robert R.; Bradley, Dwight C.; John, David A.; Seal, Robert R. ; Polyak, Désirée E.
John, D.A., Seal, R.R., II, and Polyak, D.E., 2017, Rhenium, chap. 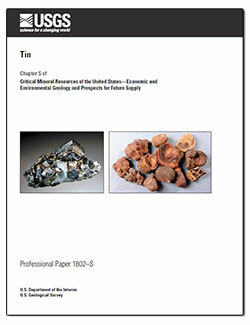 P of Schulz, K.J., DeYoung, J.H., Jr., Seal, R.R., II, and Bradley, D.C., eds., Critical mineral resources of the United States—Economic and environmental geology and prospects for future supply: U.S. Geological Survey Professional Paper 1802, p. P1–P49, https:/doi.org/10.3133/pp1802P. Schulz, Klaus J.; DeYoung,, John H.; Seal, Robert R.; Bradley, Dwight C.; Kamilli, Robert J.; Kimball, Bryn E.; Carlin, James F.
Kamilli, R.J., Kimball, B.E., and Carlin, J.F., Jr., 2017, Tin, chap. 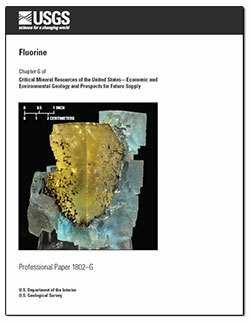 S of Schulz, K.J., DeYoung, J.H., Jr., Seal, R.R., II, and Bradley, D.C., eds., Critical mineral resources of the United States—Economic and environmental geology and prospects for future supply: U.S. Geological Survey Professional Paper 1802, p. S1–S53, https://doi.org/10.3133/ pp1802S. 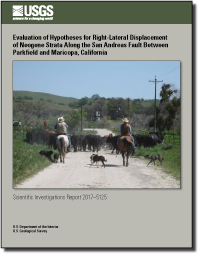 Langenheim, Victoria; Miller, David M.
Langenheim, V.E, and Miller, D.M., 2017, Connecting the Soda–Avawatz and Bristol–Granite Mountains faults with gravity and aeromagnetic data, Mojave Desert, California in Reynold, Robert E., ed., ECSZ Does it: Annual proceedings of the Desert Science Symposium, p. 83-92. Bundtzen, Thomas K.; Nokleberg, Warren J.; Price, Raymond A.; Scholl, David W.; Stone, David B.; Nokleberg, Warren J.; Bundtzen, Thomas K.; Scholl, David W.; Stone, David B.
Nokleberg, W.J., Bundtzen, T.K., Scholl, D.W., and Stone, D.B., 2017, Earth Science Atlas, in Nokleberg, W.J., ed., Dynamic Geology of the Northern Cordillera (Alaska and Western Canada) and Adjacent Marine Areas: Tectonics, Hazards, and Resources: University of Alaska ScholarWorks@UA, 8 p., 5 maps, scale 1:5,000,000. Buesch, D.C., 2017, Geochemical variations during development of the 5.4 Ma Broadwell Mesa basalt volcanic field, California: in Reynolds, R.E., ed, “ECSZ DOES IT: Revisiting the Eastern California Shear Zone”, California State University Desert Studies Consortium, p. 103-117. Bundtzen, Thomas K.; Nokleberg, Warren J.; Price, Raymond A.; Scholl, David W.; Stone, David B.; Bundtzen, Thomas K.; Nokleberg, Warren J.
USGS scientists drill a research well near Waco, Texas, as part of the assessment of oil and gas resources in the Eagle Ford Group. Cores like these provide information on the various rock layers, such as their make-up, their age, etc. Uses: electric wiring and silver-based inks create electrical pathways in electronics; jewelry, mirrors, coins, in photovoltaic cells to transform sunlight into electricity. Primary Commodity Uses: Feldspar is one of the most common minerals on the planet and is mostly used for glassmaking and ceramics. Primary Commodity Uses: Tungsten is one of the densest metals on the planet, and therefore gets used in metalworking and construction, as well as in heat sinks, weights, and even vibrating batteries. Primary Commodity Uses: Bismuth is the heaviest of the heavy metals and the only non-toxic one at that. As such, it’s seen a lot of use in replacements for lead, as well as in medications and atomic research. 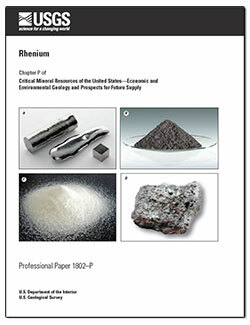 Primary Commodity Uses: The vast majority of titanium is used in whiteners in the form of titanium oxide. Titanium metal makes up a comparatively small amount of the use for titanium, but as a metal it is used in metal coatings and medical implants. For several years, KIGAM, the Korean Institute of Geoscience and Mineral Resources, has hosted an international program for geoscience resources (IS-Geo). 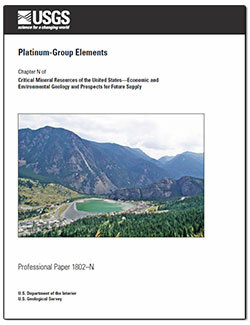 The IS-Geo program draws together federal and private-sector professionals from the international community to discuss a range of specific geoscience and mineral topics. It would be no exaggeration to say that without minerals, no aspect of our daily lives would be possible. Although often associated with helping fuel the Nation’s growth during the Industrial Revolution, coal is very much part of our space-age present. In 2016, coal-fired power plants provided 30.4 percent of the country’s electricity, and it is an important source of employment in many states.